This article was originally appeared in The Rocky Mountain Collegian on October 1, 2015. It has been republished with the author’s permission. 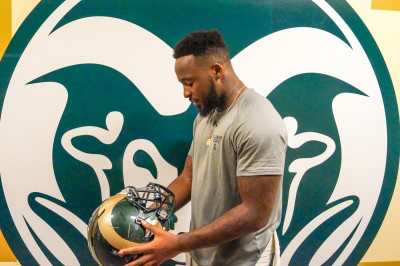 When Jasen Oden Jr. looks at his Colorado State football helmet, he sees more than 17 Ram Horn stickers earned for his play on the field through four games. He sees a reminder. “I’m proud of where I come from, but where I come from is dangerous,” Oden said. Raised in the East Ferry projects of Buffalo, New York, the senior running back sees another daily reminder in the 716-areacode tattooed on his right bicep. When he plays, his city watches. Oden believes that he is still helping to make the city better each week, even if just for a couple of hours, when he lines up in the backfield for the CSU. Lately, there’s been plenty of reason to watch Oden, no matter where you’re from. In his last outing, he racked up 143 yards and a touchdown as he carried CSU to a win over Texas-San Antonio. Heading into Mountain West play, he leads the Rams in rushing yards. Oden has been handed the ball 55 times over the last two games, and has at least 30 more carries than any other running back on the team. For a while though, it looked like his chance would never come. Oden was originally recruited to play in the secondary, and did so for two years. But after the 2013 season, the Rams were in need of a running back. Former head coach Jim McElwain saw the athletic ability and believed the former safety could make the transition. Oden obliged – anything to help the team. Oden entered the 2014 season as the No. 1 running back on the depth chart, but the opener told a different story. From the first drive against Colorado, it was apparent that Dee Hart and Treyous Jarrells were the two top backs in McElwain’s mind. Naturally, Oden second-guessed the decision to switch positions. “Feeling like you could do so much for the team kind of eats at you,” Oden said. After all, he had been a significant defensive contributor. He played in 25 of 26 games his first two years, including one start at safety. As a sophomore he recovered a crucial fumble in CSU’s win in the New Mexico Bowl. He didn’t switch positions due to a lack of playing time. He did it to try to help the team. So with just 12 carries four games into his junior year, Oden began to wonder if he could do more good by going back to the defense. “I actually did go upstairs and talked to Coach Mac about switching back to DB,” Oden said. But Oden decided to keep with his new position in the backfield. “Patience is one of the rarest talents you can have,” he said. Oden made the most of the looks he did get as a junior. In 2014, Oden averaged six yards per carry, and also forced two fumbles on special teams. After the season, University of Georgia offensive coordinator Mike Bobo took over as CSU’s head coach. Bobo was aware of Oden’s history as a defensive back, but his offensive system needed a power runner. The 6-foot, 220-pounder caught his eye. Oden had to wait until his senior year, but his patience was finally been rewarded with a fresh start. “I believe in God, and I believe God put Coach Bobo and Bryan Applewhite (the running backs coach) in my life for a reason,” Oden said. “It was my mom, her five kids, her husband, my grandmother, my uncle and his girlfriend, all living in a three-bedroom downstairs apartment,” Oden said. Originally, it was just a two-bedroom. They converted the front living room to a bedroom, which is where Oden slept. Oden was a three-year starter in both football and basketball at Buffalo East under Coach Bryant. His play was starting to draw attention from nearby universities Syracuse and Buffalo. By his senior year, Oden had really started to focus on his academics, according to Bryant. However, Oden didn’t qualify to play NCAA football when he graduated high school. There was too much else going on. Some days, he would miss school to look after his siblings. It would have been easy to make excuses, but that has never been Oden’s style. Oden took it upon himself to correct the situation with a year of prep school at North Carolina Tech. NC Tech came under scrutiny after an Outside the Lines piece in 2011 – Oden was playing for the school at the time – exposed the program for taking advantage of “teenagers in dire straits, often from backgrounds naive to recruiting and eligibility guidelines”. Oden fit the bill. Like many other students, he was promised classes that he never actually got to take, such as an ACT prep course. “I bought the ACT book, studied it and wound up getting the grade I needed by myself,” Oden said. After the prep school debacle, Oden finally joined CSU as a late signee in 2012. Three years later, he found himself entering his senior year surrounded with uncertainty. In CSU’s opener against Savannah State, he did not exactly get off to the best start. In the locker room at halftime, Applewhite pulled him aside. On the first drive of the second half, he uncorked a stiff arm that momentarily froze the crowd at Hughes Stadium during a 28-yard rush which led to a CSU touchdown. It set the tone for what has been a breakout year thus far. The senior has NFL aspirations, but just getting a college degree would be a huge accomplishment ­­– he would be the first from his family to do so. Putting on his helmet means so much more than just a game. It means a chance to show the youth from his city a better way of life. “That’s why I like to play on TV, so they can see there’s other ways,” Oden said. On the Monday following Oden’s 143-yard performance against UTSA, everyone at his old high school was still talking about the former Panther. Whether it’s his former teachers at Buffalo East or the kids currently growing up where he did in the East Ferry projects, Oden appreciates the attention. It’s a symbol of opportunity, a symbol of hope for kids from Buffalo’s eastside.